While many companies offer extremely lucrative specifications, few keep in mind that emptying and cleaning the leaf are some of the most difficult and time consuming tasks, especially when the debris is wet. Interestingly, WORX WG505 Electric TriVac Blower/Mulcher/Vacuum provides vital modifications to the bag and the nozzle design that can allow fast and efficient function, and also rapid cleaning/emptying. However, we need to know whether such convenience has been provided at the cost of any vital features, and to study this, we shall run a careful study of product concerned. This WORX Trivac WG505 product is perfect for those who…. Need to remove large amounts of variegated leaves and debris in a short time. They can make use of the powerful and extensive range of settings and using them, remove various types of debris without creating dust storms and/or damaging plants. With easy bag cleaning and impeller access facilities, the mulch and waste stuck in the tubing and blades can be removed quickly, before the product is put to use again. Further, with low noise, this product can be applied in areas where sound limits are in effect. Putting to rest our fears is a decently powerful 12 amp motor, which can produce speeds of up to 210 mph. These speeds can be modified in accordance with the requirement. A much lower minimum speed can be used around complex areas, while large fields needing huge speeds can also be catered to. 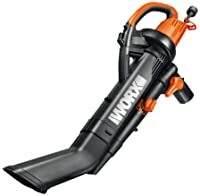 Some types of hard and wet debris can ruin plastic impellers, and so we find Worx providing WORX WG505 Electric TriVac Blower/Mulcher/Vacuum with a heavy duty metal impeller that can handle large amounts of debris without suffering from clogging, bending of blades, etc. Indeed, even solid debris can be handled better, making it ideal for removing small amounts of crusted soil, etc from patios. Such versatility is enhanced further by the introduction of an angled nose-tube that allows leaves to move in at an angle that makes mulching much easier. 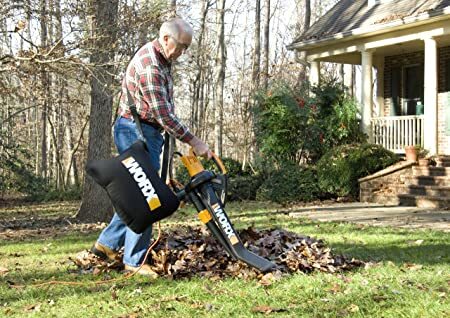 The impeller and motor together combine to provide an excellent reduction ratio of 16 bags of leaves to one bag of mulch. This mulch, furthermore, can be created at a fast pace courtesy of the 14 gallons per minute capacity of the product. The USP of this product is the introduction of a breathable nylon bag that can be cleaned easily. Furthermore, a quick connect coupler ensures that the product is easily assembled and disassembled for cleaning. Lastly, there is a single button impeller access facility that allows the product to be cleaned internally without use of any special tools. If you need to remove large amounts of variegated leaves and debris in a short time, WORX Trivac WG505 product is perfect for you. Good speed and excellent nose design make the product versatile and efficient at the same time. Working volume combines with reduction ratio to produce fine mulch from huge amounts of leaves at a good click. Speed modifiability and powerful impeller ensure that even when working in delicate areas, the efficiency is not compromised. Can be maintained with ease, and cleaned multiple times during a leaf collection and mulching session without requiring any major disassembly. Though the impeller cleaning process requires that the product be turned off, this is not mentioned on the machine, thus creating the possibility of the user opening the product without turning it off. This can pose a potential safety hazard for those unacquainted with the product. However, the user manual contains a note on this topic, so users who have read the manual will know about this issue and carry out maintenance accordingly. Simple maintenance is an important forte, because it allows the WORX WG505 Electric TriVac Blower/Mulcher/Vacuum to provide service using its excellent hardware, without asking the user to pause and clean the product at regular intervals with special instruments. This reduces the overall time taken by this leaf vacuum mulcher to rid a garden of its leaves, thus saving the user’s time significantly. For those seeking a fast and dependable mulcher that doesn’t require complex maintenance, this product is one of the best in the market.